What is the shape of Tablet ? Ofcourse, Rectangle. 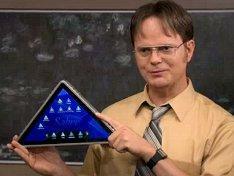 But this may change soon.Again it depends on how fancy,comfort and techy the Triangle tablet will be. 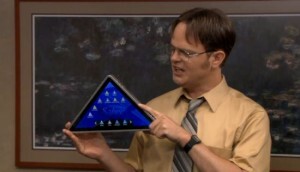 Based on popular television show "The office" ,in which a triangle tablet is shown instead PC tablet for fun became an inspiration to Eric Calisto. Taking into consideration of its shape and "The power of the pyramid", Eric Calisto has named this product "The Pyramid". In order to develop this he needs funding and started a website looking for donors at Kickstarter. Currently this tablet is called "The Pyramid" but those who gives $5000 will actually get to pick the name for the tablet. This product looks totally different from conventional PC tablet, but I am not sure it will replace it. What do you think ? Please drop your comments. How do we get with good budget about traveling and related things?